Started college and then got married at an early age of (19). Started working at Ford Motor while raising a family. Swithced jobs going to work at GM as an Experimental Buyer and stayed for (10) years. My wife of (48) years went back to school and received her Bachelors and Masters degrees from Wayne State in nursing. I retired as president and owner of Sam Solomon Associates a manufacturer's representative company. We winter at our home in Scottsdale, AZ and spend the rest of the year, when not traveling, in Michigan. Our oldest grand child is in his second year at Colorado University and we have (2) who will graduate high school this June. The other (5) are in high school, middle school and elementary school. 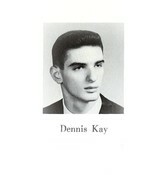 Dennis Kay has a birthday today.